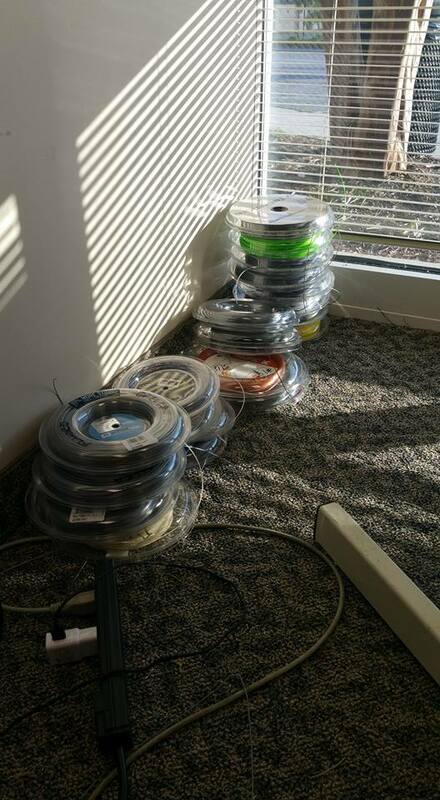 The final numbers won’t be in for a while, but I was organizing my string reels for the ITF Pro Circuit Wake Forest Futures at Wake Forest University (USA F17) and thought I would provide this preliminary string check photo. From left to right: Luxilon reels, Solinco reels, and all other reels (Head, Kirschbaum, Toalson). 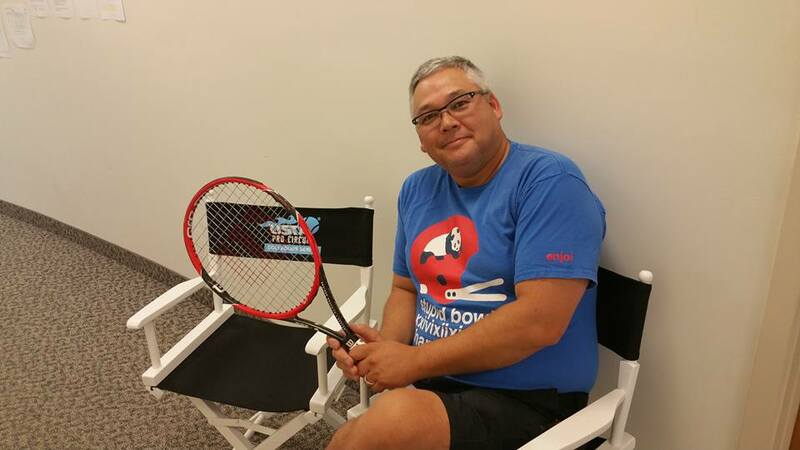 At the 2015 ITF Pro Circuit $15K Futures of Winston-Salem last year, I strung rackets for 34 different players. The number increased to 47 different players in the 2016 tournament (out of 83 unique players in the singles and doubles). The total number of rackets I did for the tournament also increased from 112 in 2015 to 139 in 2016. So, the additional $10K in prize money seemed to make some difference in players’ willingness to pay for on-site stringing (although I heard the numbers for this year’s Tulsa $25K the week following Winston-Salem were lower than the 2015 Winston-Salem Futures). Last year the top stringer was the tournament champion, Matija Pecotic, with 15 rackets. This year’s champion, Sekou Bangoura, only strung 7 rackets. Top stringers this year were three players tied with 8 rackets each: Jon Ho and Dennis Uspensky, both Wake Forest players who I have tried to teach the importance of racket stringing, and Emil Reinberg of the University of Georgia, who fought his way through qualifying and won two rounds in the main draw for 5 total matches. Like last year, almost all players (42 of 47) used all monofilament strings, including two who used hybrids of two different monofilaments. Two players used a traditional hybrid of monofilament mains and synthetic gut/multifilament crosses, and one player used natural gut mains and monofilament crosses (something we see much more commonly on the ATP World Tour). 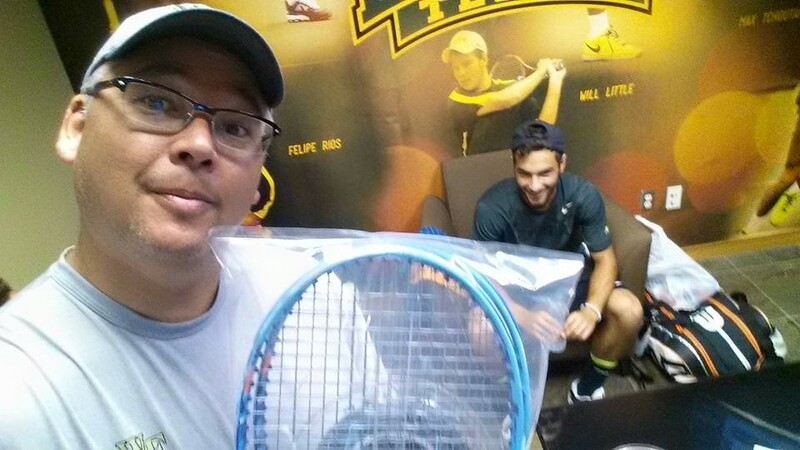 At the ITF Pro Circuit $15K Futures of Winston-Salem last week, I strung rackets for 34 different players. 33 players used all monofilament strings, including one who used a hybrid of two different monofilaments (Luxilon 4G S mains and Luxilon Alu Power crosses). 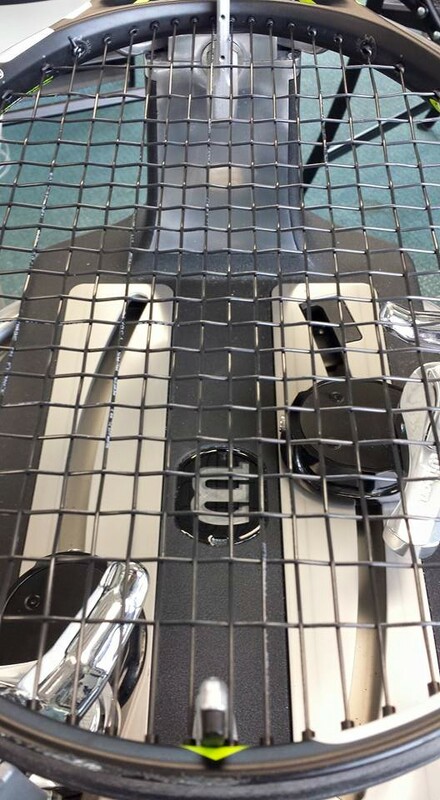 One player used a traditional hybrid of Luxilon Alu Power mains and Wilson Sensation crosses. As I noted in my post on stringing at the NCAA tournament recently, the plurality of players using Solinco string is evidence of their success in connecting with junior and college players, and those connections seem to be percolating up to the lower levels of professional tennis now (which see a large number of junior and college players involved). On the ATP World Tour, Luxilon is still the dominant string, but we do see more Solinco string there, too. More in later posts on racket brands and tensions. Today is the 5th day of the ITF Pro Circuit $15K Futures of Winston-Salem, including three days of qualifying. 7 first round singles matches and all 8 first round doubles matches were played yesterday, and 9 first round singles matches and the doubles quarterfinals are scheduled for today. Having strung at ATP World Tour 500 level (Citi Open in Washington) and 250 level (Winston-Salem Open) events, the contrast with the Futures circuit is striking. It was interesting this morning to see individuals playing for a few ATP ranking points and a few hundred dollars in the lounge watching Nadal and Djokovic playing in the French Open quarterfinals for hundreds of ranking points and hundreds of thousands of dollars. 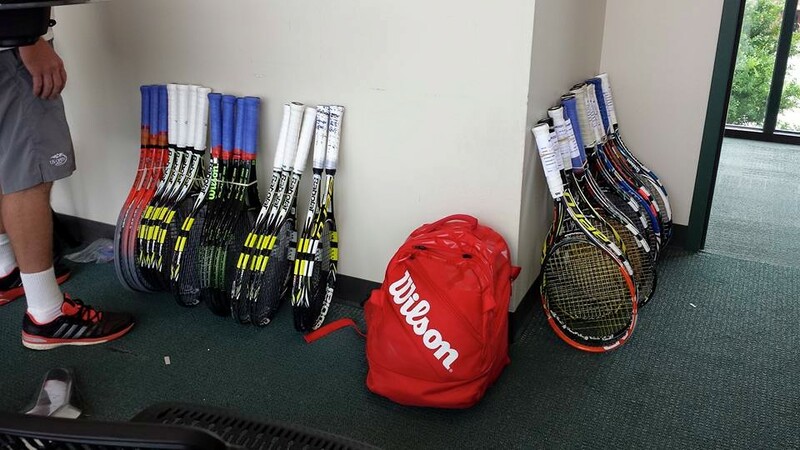 *Although I am stringing plenty of rackets, there are a number of main draw players — including 4 of 8 seeds — who had no rackets strung for their first round matches. I know a couple of players are traveling with their own portable stringing machines, including one who forgot his cutters so stops in every day to cut the tails on his strings. This contrasts sharply with a Milos Raonic, Kei Nishikori, Jurgen Melzer, and the like who will string 4-6 rackets for every match at Citi Open or Winston-Salem Open. *ATP World Tour string brand of choice: Luxilon. ITF Pro Circuit Futures string brand of choice: Solinco. This is no doubt due in large part to Solinco’s aggressive efforts to gain a foothold with top junior players and colleges (as noted in my previous post on the NCAA tournament). *On the ATP World Tour, players have access to player dining on site for lunch and dinner, snacks, and coolers full of bottled water and sports drinks. At this Futures event at least, there is no player dining (unless you count the vending machine) and drinks must be paid for. *On the ATP World Tour, the official hotel in Washington was the W and in Winston-Salem the Marriott. At this Futures event, the official hotel is the Winston-Salem Hotel and Spa, formerly a Ramada. *On the ATP World Tour there are hotel shuttles and courtesy vehicles to transport players to and from the airport and hotels. At this Futures event, players have arrived from the airport in taxis, and my wife gave one player a ride to his hotel when she saw him walking down the street carrying his racket bag and recognized him from the stringing room. Just as I was finishing this post, I was asked by the Tournament Director to serve as the “acting tournament director” because he had to go out to buy lunch for the tournament officials. My only official act as acting tournament director: I sold two Gatorades. Still, at the end of the day, there is tennis. That it is not on television doesn’t make it any less exciting. To me at least. As noted previously (here and here), I recently spent 2 weeks as one of the official on-site stringers for the NCAA tennis tournament at Baylor University in Waco, Texas. Although we had some competition from off-site stringers who aggressively solicited business away from us, the four members of the MOZI Tennis team still strung several hundred rackets. This included the women’s doubles champions from Alabama, and the men’s singles, women’s singles, and men’s doubles finalists (from Wake Forest, Stanford, and Texas). I personally worked on rackets for 49 different players from 27 teams. This included 18 women from 12 teams and 31 men from 15 teams. Although this is not a random sample of all players in the tournament, it is a fairly diverse group of players. I find it interesting that even though men can generate more power on their own than women, women tend to string tighter than men. Part of this may be due to women generally using more open string patterns than men, but it is also the case that each player develops their own feeling for the optimal string tension for their particular racket and game. 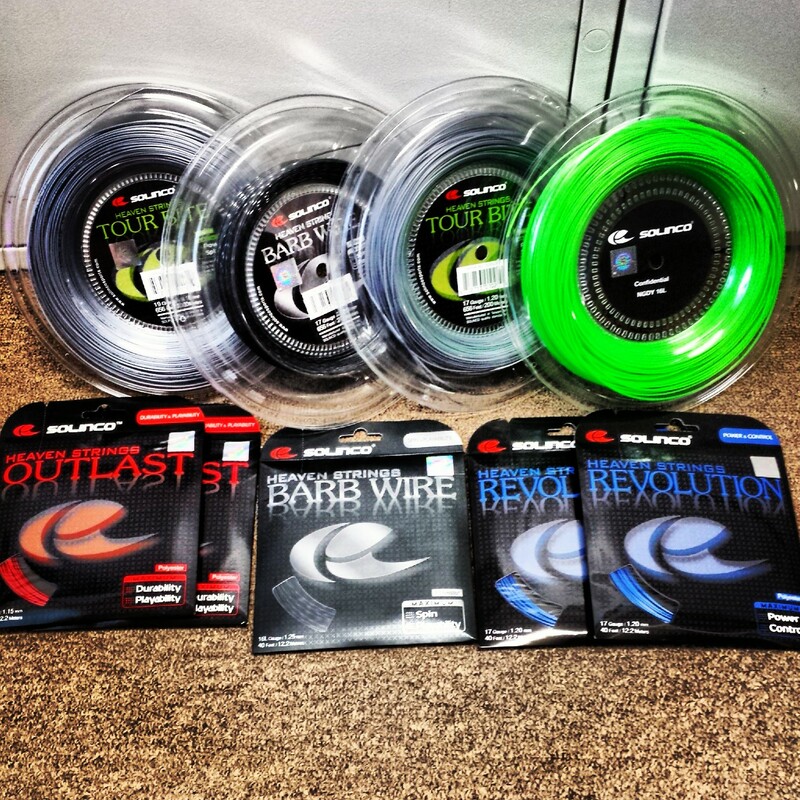 To wit: the highest recorded tension in our stringing room was 69 pound mains and 68 pound crosses. Almost all of the players, men and women, used all polyester monofilament strings – 44 of 49 players. 4 players used hybrid stringing (monofilament mains and synthetic gut/multifilament crosses), and 1 player used all multifilament string. Pacific was overrepresented because I strung all of the rackets for Wake Forest men’s tennis team which has an agreement with Pacific. An amazing 94% of players used one of three brands.